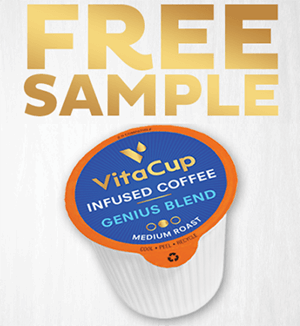 Get a FREE VitaCup Genius Blend Coffee Pods Sample at select Walmart locations starting March 22, while supplies last! Find a participating Walmart store. Start your day the smart way with VitaCup Genius Blend Coffee Pods! Infused with brain food and essential vitamins, VitaCup helps boost energy, support metabolism and increase focus!